On the occasion of Memorial Day I can’t help but remember my grandfather. He was a WWII vet who would recount to me on what seemed every chance to tell me stories of the war over in the European theatre. The most intersting ones were always told when he was shaving. I remember being a little girl, dressed in my best Sunday dress waiting to go to church with Grandaddy in his big gas-guzzling Cadillac. I’d always have fun just being mesmerized by how careful his shaving ritual was and how much pride took in it. I’d have fun ‘painting’ the shaving cream on my small hands and laughing as he would bend down for me to pat it on his face. It had to be the second-coolest thing he’d ever done aside from taking out his false teeth on playful demand from me. The shaving ritual is as cool from old school guys like my grandfather to the likes of Vin Diesel shaving his head with a makeshift knife and engine grease in the movie Pitch Black. But for the men in your life who only know the likes of a disposable razor, propellant-based shaving cream and the dreaded Axe body spray, it’s time for a shaving intervention. And for those who are already firmly entrenched in the Brotherhood of Shaving, check out some new items to freshen up the routine. For your consideration, I present two brands I believe have the most in variety and product innovation to offer for a memorable gift this Father’s Day. Straight out of Texas, home to Walker, Texas Ranger, this mens grooming collection consists of premium quality, high-performance, easy-to-use grooming products for men. It’s unimstakably masculine packaging takes its style cues from old-school liquor labels and cigar boxes. Frankly this is the line I’d steal things from to use myself and would admit to it. Winner of the ‘holy grail lip product’ award on Beauty blogs for their SPF25 lip balm, the product line is both old school yet modern. It’s very easy to say everything is a ‘must have’ from this line because it is–it’s that good. Its unabashed masculine design makes it perfect as a ‘mans man’ Father’s Day gift. Personally I think Chuck Norris would approve. 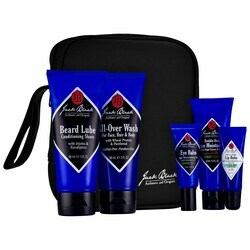 Jack Black products are available at Nordstrom stores and at Beauty.com, Sephora.com, Ulta.com and of course at GetJackBlack.com. A luxury line of locations offering an old-school shave at their Barber Spas, it also has a line of products and hand-crafted shaving implements dedicated to, you guessed it, the Art of Shaving. If you’re shopping for the man who has everything, this is a great place to start. 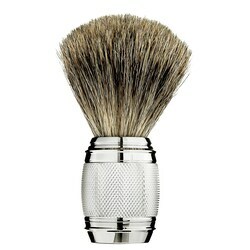 The Art Of Shaving products are available at Nordstrom.com, Sephora.com, and at their website at TheArtOfShaving.com (where you can get gift certificates for their Barber Spa services). So what kind of shaving products do you recommend for a guy like me? Not sure what to get? Luckily for you Sephora has you covered as they offer The Finest Shave Deluxe Sampler. This is a gift box consisting of six (6) deluxe samples of various shaving items from the likes of Anthony Logistics, The Art of Shaving, Jack Black and more. For only $25, he gets an assortment of items to try and can redeem the enclosed certificate for a full-size version of his favorite item from the set. This is an extremely good deal considering the total value of the set is $65. So now that you’ve decided, you have to get something to put all that stuff in, right? How cool, how unique, how downright impressive is it to put everything in something like this? Harvey’s Seat Belt Shave Kit Bag. Also available in Camo and Grey. Built in the USA, Harvey’s produces this shaving kit bag made from automotive seat belts, retails for $68 and is guaranteed for life. You can purchase at SeatbeltBags.com.